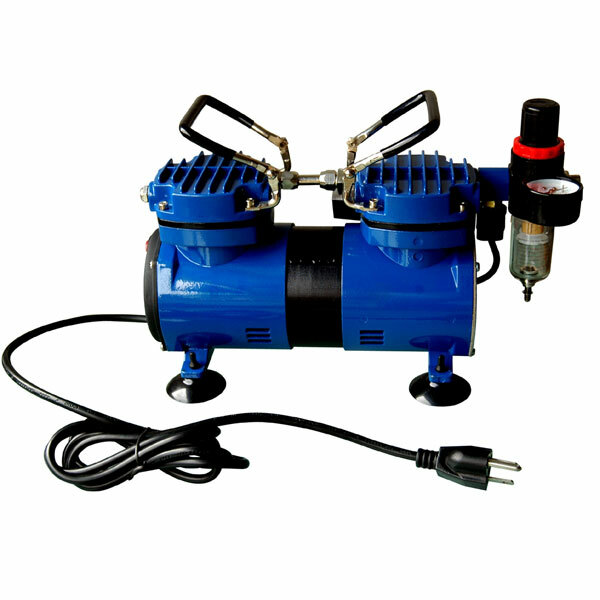 The Paasche DA400R is a medium duty, 1/6 HP oil-less piston compressor with an operating pressure between 30–50 PSI, depending on the airbrush being used. It operates on standard household current (110–120V), and delivers 1.48 CFM. The auto shutoff feature enables the compressor to turn itself off when the airbrush is not in use and back on when the user resumes airbrushing. This eliminates heat-related moisture buildup, reduces running time, and minimizes motor wear. The DA400R includes an R-75 regulator and moisture trap. Weighs 12.2 lb (5.5 kg).